Megastar Sridevi honored at the BRICS Business Forum Leadership Awards! 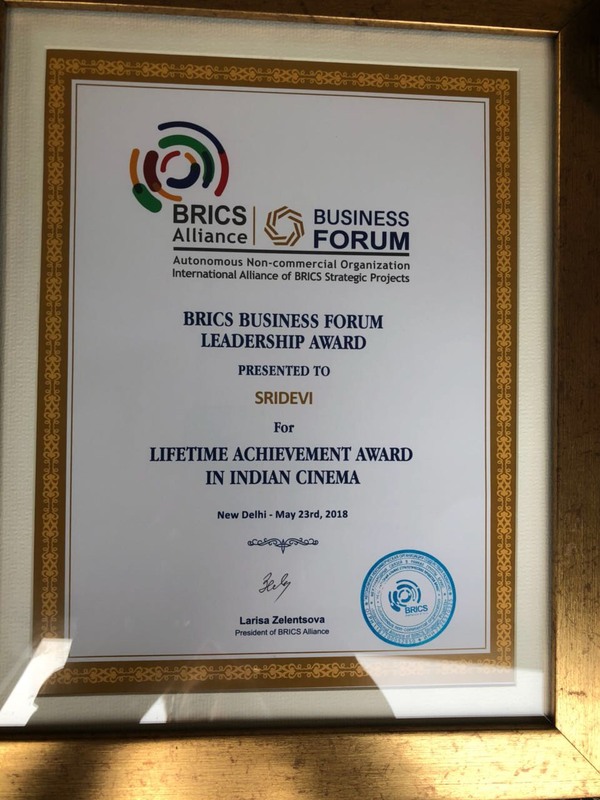 The late megastar Sridevi was recently honored with a Lifetime Achievement award at the BRICS Business Forum Leadership Awards for her illustrious 50 year career in Indian cinema. The BRICS Alliance Business Forum aims to bring together business leaders, business facilitators, investors, entrepreneurs, and professionals from around the world. Reena Marwah, sister of producer Boney Kapoor, received the award and memento from Larisa Zelentsova, President of the International Alliance of BRICS (Strategic Projects) and Minister of State in the Prime Minister’s Office Dr. Jitendra on behalf of the Kapoor family. Sridevi was also voted ‘India’s Greatest Actress in 100 Years’ in a CNN-IBN national poll conducted in 2013 on the occasion of the centenary of Indian cinema.The Padma Shri laureate, was also honored with a National Award for her performance in MOM .The film also won her a Filmfare award for Best Actress. Kriti Sanon’s traditional avatar is making us want to see her more !